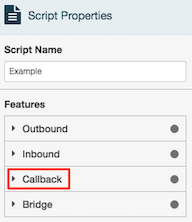 Enabling a script’s Callback property allows Create Callback actions in Architect call flows to select the script. This setting is disabled by default. Click the Callback property group.